Last night it was J.A. Happ, felled by a line drive, bleeding from the ear – and yet out of the hospital within 16 hours. Last year it was Brandon McCarthy, felled by a line drive, walking off under his own power and pronounced fit and then suddenly requiring especially dangerous brain surgery (and not utterly incidentally, still having not had one good start since). Yesterday it was the 56th anniversary of the day it was Herb Score – who was thought to be on his way to the career Sandy Koufax wound up having – felled by a line drive. 38-20 with 547 strikeouts in his first 512 innings in the majors, 17-26 with 290 strikeouts in his agonizing last 346. In 2011 it was Juan Nicasio and it was 2000 it was Bryce Florie and in 1994 it was Mike Wilson and in 1991 it was Wally Whitehurst. And before them it was Steve Shields, repeatedly. And it’s been Kaz Ishii and David Huff and Matt Clement. And Joe Beckwith – who got hurt not because he was hit with a line drive, but because he did such a superb job of quickly getting out of the way of the line drive that in doing so he altered the vision in one eye and had to have corrective surgery on the good eye before he could resume his career. And in youth and college baseball, where the bats are aluminum and the skulls aren’t always finished, it was Gunnar Sandberg of Marin Catholic High in northern California who spent weeks in a coma and a year off the field (and if all this isn’t enough for you, here are more – if you have a stomach for them). So once again the debate begins about giving helmets or at least lined caps to pitchers, and half of baseball insists it will have to happen after this incident, and the other half (including nearly all the pitchers) insisting it never will happen. Branch Rickey not only fostered the introduction of the helmet for batters, but later helped to develop (and actually own most of the stock in the company producing) the kind of helmet worn today – the one that can fit over a cap rather than force the batter to swap the one for the other After his successes in Brooklyn Rickey was squeezed out by Walter O’Malley and he went on to Pittsburgh where, in 1952, he mandated that his batters use them. A year later he announced that all the Pirates would wear the new helmets – at the plate and in the field. The Pirates were said to not even pack ordinary cloth caps on road trips. 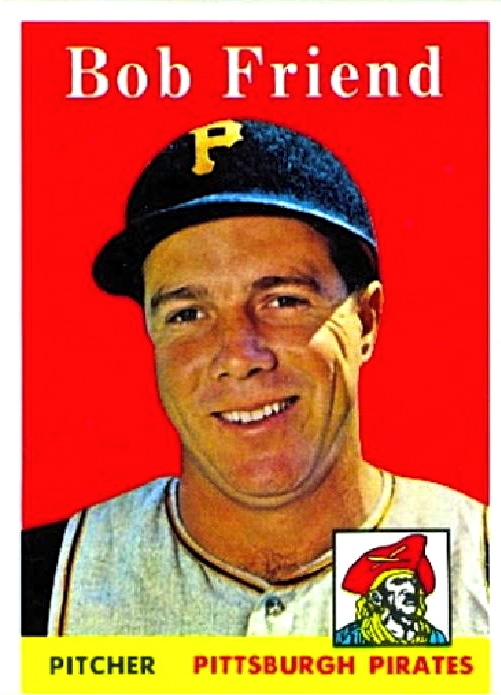 Several accounts have the Bucs’ pitchers quickly – within weeks – discarding the helmets for the same reason today’s pitchers dismiss the idea: they were too heavy and clunky and sweaty. Critics called them “Miners’ hats” and said they were for timid men and bush leaguers. But Pirates’ pitchers didn’t dismiss them, not entirely anyway. 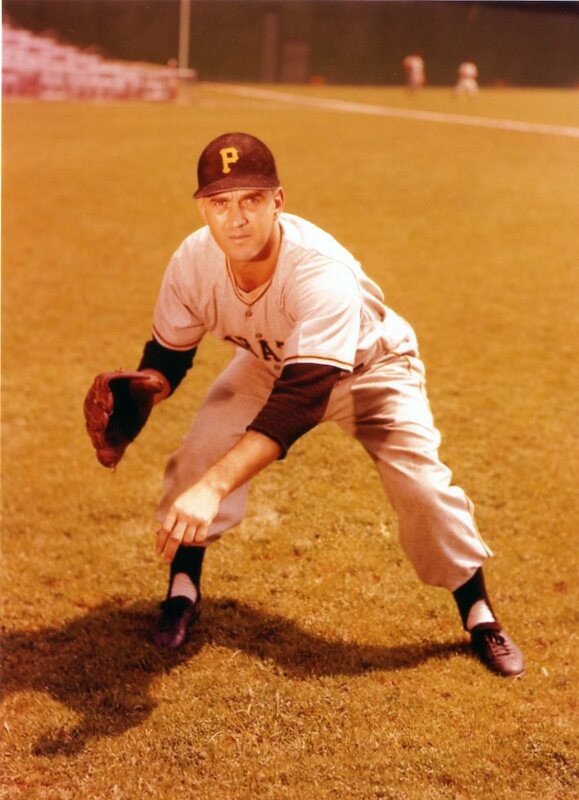 Nearly all the Pirates’ publicity and pre-game photos through the 1956 season showed their players – including the pitchers – in the helmets. 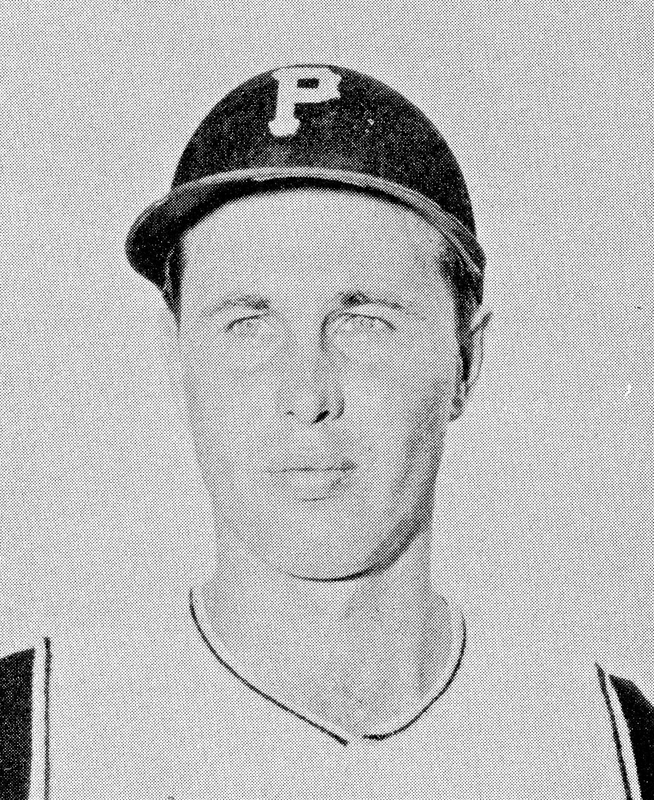 While photos of Pirates’ pitchers in ordinary cloth caps begin to reappear during the 1957 season, the helmets were still worn at least intermittently, at least before games – and with such great frequency and chronological ‘nearness’ (I don’t think Fred Waters went in and changed back into a cap before that game started – not in 1956) that it’s probably safe to say the pitchers at least wore the helmets sometimes during actual games. When Rickey had said “all Pirates,” he meant it. The coaches and managers wore them – at least until Danny Murtaugh took over the latter job in the middle of the 1957 season. As late as the 1959 team yearbook there are team portraits of pitchers (and other players) wearing helmets. This shot of Bob Thorpe (who made a cameo with the 1955 Cubs and died at the tragically young age of 24 in 1960) is significant because a) Thorpe was a pitcher, and b) he didn’t join the Pirates’ organization until 1958. 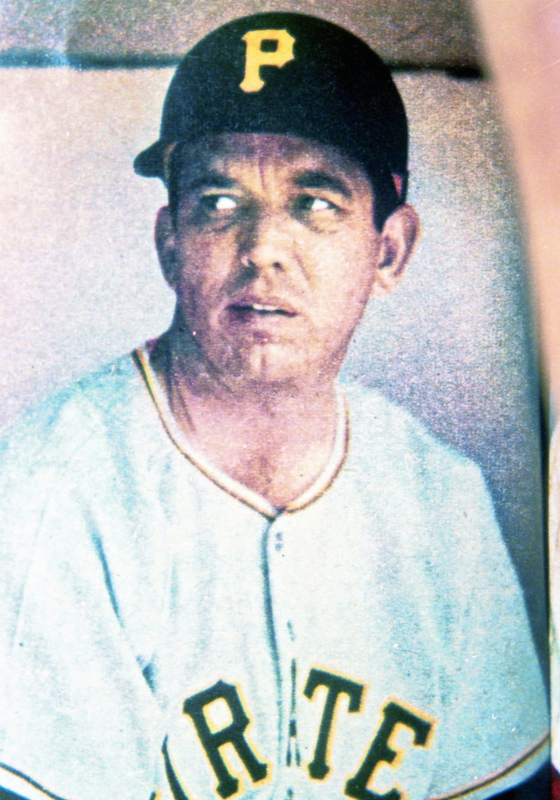 Pitcher Bob Thorpe, as depicted in the Pirates’ 1959 yearbook. So did Rickey’s forgotten experiment have any practical impact? There are no accounts of Pirates’ pitchers being saved from line drives by the helmets. Statistically? 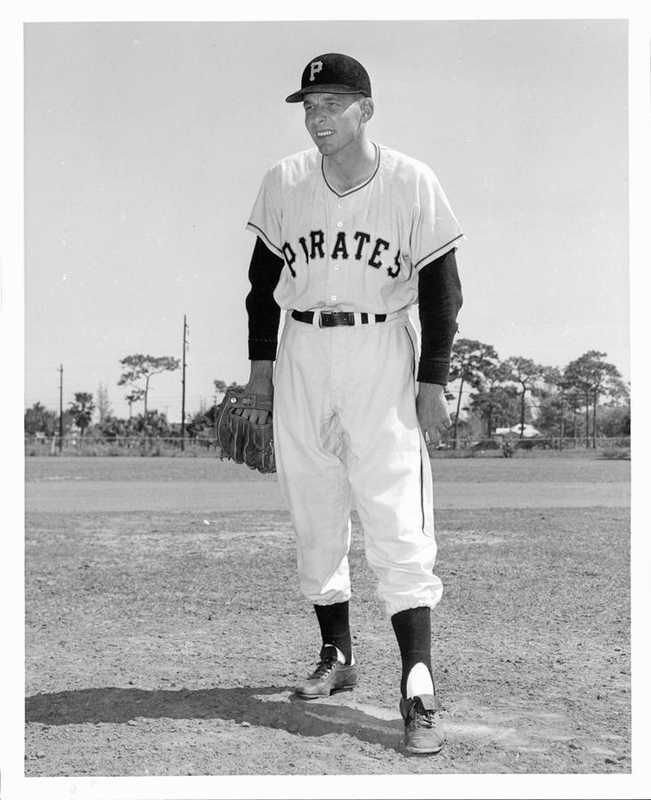 Since we don’t know how consistently they were worn (or exactly when) we can’t be sure if either of these facts are relevant: among them Pittsburgh pitchers compiled exactly one sub-4.00 ERA in ’53 and ’54; on the other hand, Pirate Bob Friend led the league in ERA in 1955. Did he do it while wearing a helmet? This is Friend’s 1958 baseball card. Either like Waters (above) he was photographed by Topps at the Polo Grounds in New York 1956, or they got him in ’57. In either case he wasn’t wearing it special for the photographer – that’s for certain. So why the focus on the idea that this secondary controversy (“How can you expect manly pitchers to wear padding or protection?”) was already broached by Branch Rickey while Jackie Robinson was still playing for the Dodgers? Why not debate the merits? Because there are merits on only one side of the debate. With taller pitchers taking longer strides against stronger hitters using harder bats, the pitcher is even closer to the hitter as he delivers the pitch than he ever was before – and even if he’s 5’7″ he’s still closer to the hitter than the hitter was to him when he released the pitch. The ball off the bat is going 15 to 20 miles per hour faster than the fastest pitch any pitcher can throw. Among the men in imminent danger of having insufficient time to react to a line drive, the plate umpire, the catcher, the batter, the first base coach and the third base coach must now all wear a helmet (and the catcher and ump have helmets) . Only the pitcher is – inexplicably – unprotected. And if the miners’ helmets of the 1950’s are too clunky or too sweaty for 2013, there are more comfortable and stylish liners or reinforced caps that can at least do something – even if it’s only to give the pitcher, in that split second of recognition, a slightly increased chance of moving his head half an inch so the helmet takes the brunt and not his skull and the flimsy cloth that now protects it. But this is baseball. The sport had its first fatal major league hit batsman in 1920, yet the helmet wasn’t even used experimentally until the 1940’s, didn’t become mandatory until 1971, and the last grandfathered batter (Bob Montgomery) took his last cloth-cap swing on September 9, 1979. We might very well not only have to wait for a pitcher to be killed before baseball does anything about this – we might have to wait until then and add 51 years to the wait.